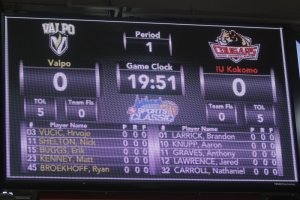 IU Kokomo takes on NCAA Division I program Valparaiso in the 2K Classic. VALPARAISO – For 12 young college student-athletes, it was a trip-of-a-lifetime when they departed the Indiana University Kokomo campus last Saturday, traveled up US 31 and across US 30 to Valparaiso University to battle the NCAA Division I Crusaders in a subregional round game of the well-known 2K Sports Classic Benefitting Coaches vs. Cancer. While some thought it was crazy for a first-year program that has not even been accepted into the NAIA ranks yet (application has been submitted) to accept this challenge, Cougar head coach Jace Thompson saw it as an opportunity. He said he told the team to think back to their high school teammates, most of whom are not playing college basketball, and consider their thoughts on making the trip to Valpo. Before the game, Thompson said he knew going in the outcome could look very bad on the scoreboard. But after the final horn sounded, Valpo only won by 31 points, 79-48. Even though the Crusaders played many players who usually don’t see very much floor time, the fact remains those players are on an NCAA Division 1 scholarship while the IUK players are technically walk-ons in a non-affiliated program. That said, most observers would say IUK performed very well on the big stage. IUK played NCAA Division II University of District of Columbia the following afternoon as part of the 2K Classic at Valpo, losing 87-51. The Cougars stay on the road for a game at IU Northwest on Nov. 26. IU Kokomo beat IUN on Nov. 1, 82-76. Kokomo returns for a pair of home games at Western High School, Dec. 1 against Goshen College JV and Dec. 6 against Marian. This entry was posted in Basketball, Cougars, Indiana, Indiana University, IU Kokomo, IUK. Bookmark the permalink.